Better late than never, right! I'm finally getting around to this weeks Mojo Monday Sketch, thanks to a little push from my friend Sue. We got together on Friday for a visit, I normally can never get anything inky done when we get together, as I have such a hard creating outside of my element. Both Sue and I started on the Mojo Monday Sketch, and I took mine home to add color and finish assembling. Don't you just love peeking in the windows to look at people's Christmas Trees! The new exclusive Window Die from Our Daily Bread Designs (available November 1st) makes it easy to create wonderful scenes! 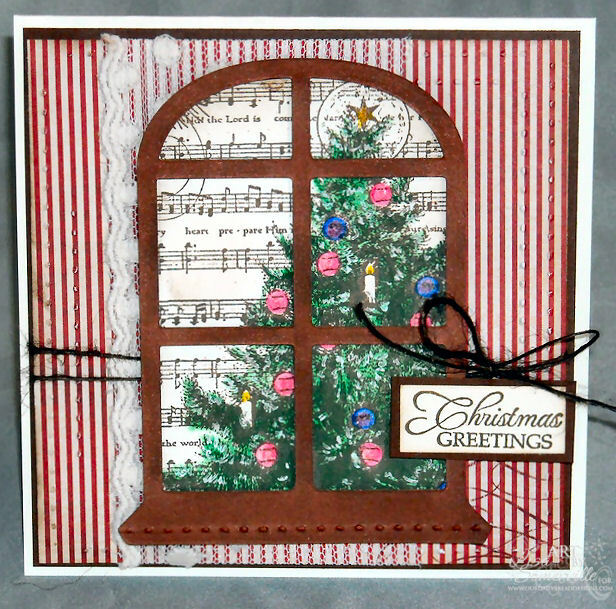 On this card I used the new Window Die (which also comes with curtains) along with the beautiful Christmas Tree Collage. The image is stamped in Ranger Coffee Archival on Vanilla then colored with Staedtler Karat Colored Pencils and Gamsol. I added some Ranger Rock Candy Distress Stickles to the ornaments, then popped up the Window Die on dimensionals. The sentiment is from the ODBD Ornaments 2 set, also being released on November 1st! To embellish the card, I used some Websters Pages lace, Creative Impressions Brown Twine, and some texture using the Scor-Bug Embosser. I love the vintage feel the Embosser adds. Fabulous! SO glad you finished your Mojo MOnday card from our stamp date! Love the paper and how the tree looks through the window. Wonderful card and I love that window! It reminds me of driving around and looking at the Christmas trees through the windows of houses! Have a great Sunday! Beautiful work. I love that stamp and already ordered one for me! Thanks for joining us at Christmas Inspirations challenges this fortnight. Hope you will play again next challenge too. Wowza, beautiful and you are so right, I love looking at people's trees through the window. Your coloring and sparklies and sponging are great touches! Lisa, you did a fabbbbulous job on this! Love your window card! Hope you're doing well. hugs! Lisa - it's Gor-JUS. I'm so glad you joined us at Catered Crop. Putting me the Christmas spirit. This is gorgeous! I love the window and tree! The sheet music is a beautiful touch. I love seeing how you were inspired by my projects!